Getting ready to have twins doesn't leave me with a lot of pampering time if I'm being completely honest. Using specialized skincare to target certain problem areas has been a lifesaver for me lately. Earth Therapeutics makes a variety of patches to focus on areas like under your eyes or your nose. 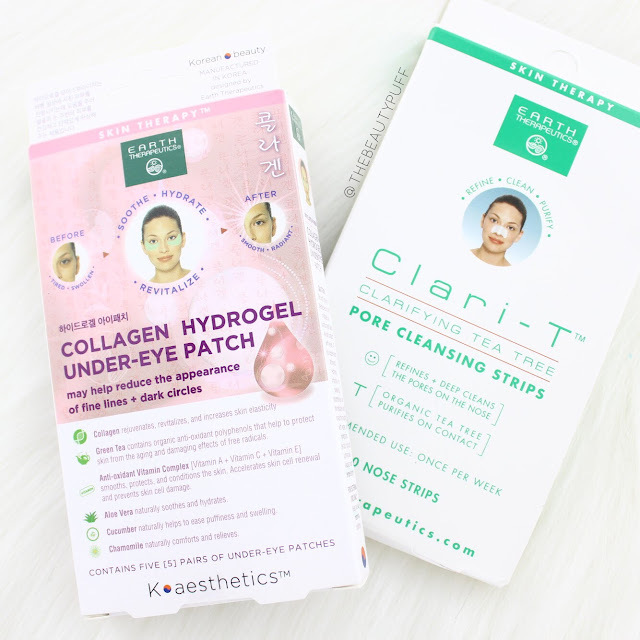 I have two products from their K-Aesthetics line - the Collagen Hydrogel Under-Eye Patches and the Clari-T Clarifying Tea Tree Pore Cleansing Strips. K-aesthetics Collagen Hydrogel Under-Eye Patches | $9 | Each pack of under-eye patches comes with 5 pairs. They are single use patches that you apply to clean, dry skin and leave on for 30 minutes. Key ingredients include collagen for elasticity, green tea to protect skin, aloe to soothe, cucumber to reduce puffiness and chamomile to comfort skin. These patches are not the least bit gooey or sticky and they very easily stay in place so you can go about your household chores, or just relax if you want. They feel cooling, soothing and really moisturizing on the skin. Once I removed them I noticed instant hydration, brightness and smoothness that I wouldn't have gotten from a typical eye cream. These will definitely come in handy for early mornings with my little ones! K-aesthetics Clari-T Clarifying Tea Tree Pore Cleansing Strips | $6.99 | I'll be the first to tell you I'm always skeptical about nose strips! They tend to irritate my skin and not do what they claim to do. These, on the other hand, are amazing. I'm a huge fan of tea tree oil and the effects it has on my skin! These strips not only unclog pores, but also clarify and minimize the look of pores after first use. Just moisten your clean skin, apply the nose strip and let set for 10-15 minutes or until dried. I was shocked how small my pores looked after removing these strips! I don't remember the last time I saw the skin on my nose look as good. It's so easy to use one strip a week while doing laundry or getting ready for bed, love that! You can find the entire line of Earth Therapeutics products on their website and select products below on Ulta.com.